After the swishing and sloshing of the dishwasher hissed to silence, I opened the door and removed a small stoneware jug from the steamy interior and patted it dry. “What’s wrong, Juliana? You ain’t movin’ a muscle.” Maybeth’s bossy old voice trilled. She had maneuvered behind me in her wheelchair. It was my idea to go on a spring cleaning mission in Maybeth’s kitchen and place everything that was inside her china closet in the gentle cycle of the dishwasher. It was Maybeth’s idea that I hand wash the china and crockery, laying each piece on an embroidered linen dish towel to dry. I took a deep breath before I turned and held up shriveled scraps of plastic in one hand and the cream jug in the other. Maybeth fidgeted with her homespun dress. “That jug was Grannie Blair’s heirloom. She poured real cream topped off milk in a glass bottle out of it every morning and soaked her oatmeal. 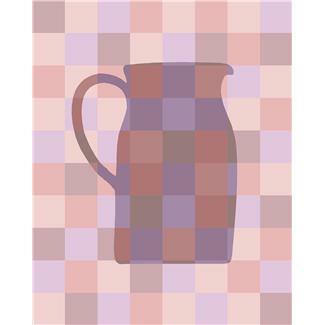 If a decal was good enough for her, a decal on that jug will be good enough for me!” She closed her eyes and pressed the plain brown jug to her sagging bosom. “A Heliotrope or maybe a Petunia.” She sighed.